Ascolta "Full Frame vs Aps-c cameras" su Spreaker. not because Sony or Panasonic are not good, but because reflex cameras have specific lens that does not fit in other brands, at least without an adapter that can give you some issues. So a Canon lens does not fit into a Nikon or a Sony or a Panasonic and vice versa. Many years before the digital age Canon and Nikon were the most used cameras, so there are more lenses for those two brands, both original and compatible. Today probably Sony and Panasonic give you more quality spending a given price, especially if we talk about the 4k footage, but Canon and Nikon are still the best choices for me if you want to make money with stock images and stock footage. but please start thinking about buying a camera that creates 4k footage as well, because you can earn more with that. Shutterstock sells 4k stock footage at $149 and Storyblocks at $199. They do it in the marketplace where producers get a 100% commission, so it takes just a few sales to pay the camera price. I've started the episode with a bang. It's difficult to find a blogger who suggests two brands, without being paid to do it. This is not because I'm not politically correct. If you read my posts you know that I am one of those people who goes straight to the point, so if you are listening to me, I bet you love my style, and so I decided to give you exactly what you like, as Julius Caesar at the Colosseum when the spectators asked him to see blood. I give you cultural information: Julius Caesar was born many years before the Colosseum was built, but this is not important for selling your photos and videos online. I'm going to tell you the difference between telling you a story that begins many years ago, at the end of the last century. For years those of my generation, I was born in 1977, have thought about the last century as 1800, but more than a decade ago the last century became 1900, and yes, we are becoming very old. In the pre-digital era, the photos were not recorded on memory cards but films. a more panoramic format, 10 × 25. APS was like the DeLorean of photography, without being featured in Back to the Future, so without becoming a myth for my generation because of Mychael J. Fox. APS which is 16 × 25 mm. The fact that the latter is smaller gives two major differences: the first is negative, since the sensitivity to low lights is lower, and therefore cameras with APS-c sensor must raise the ISO to expose correctly, and kill the image quality. The second is positive because the sensor is smaller, so even the camera it is so, and it is also lighter. studio footage, like food or models. the Canon Eos 550d or Rebel T2i, that was the first DSLR that cost under 1000 euros to do it. I eat a sandwich while the camera is shooting a time-lapse. If I used a full frame camera, the second day I would not get out of my bed for a backache. As I used a camera with the APS-c sensor, during the first evening, after walking for miles, I had the strength to go out and create four time-lapse sequences, two of which are among my best sellers ever. One of those time-lapses, in front of the Arc de Triomphe, is my best seller on Shutterstock, with more than $1,000 in revenues. Considering all the other agencies profits, that evening I created contents which earned me about 4000 euros. It was a completely different period for making money producing microstock, and anyone of you who starts today will not be able to repeat that same performance. So please, don't go to Paris, booking a five stars hotel, which is quite expensive in the city, because you think that money is not a problem because you'll pay your trip with your stock footage sales. Not anymore, unfortunately. Choosing the wrong DSLR for me, it would have cost me a lot. but because is lighter and smaller. I choose Eos 700D to avoid shooting real-time footage at night, because I know that the Agencies probably would reject the clips for poor quality, but with a lighter camera I can shoot more during daytime, and even in the nights because I would be less tired, and my camera can have a fine time-lapse quality even with low lights, because I can use slow shutter speed. If I were specialized in studio shooting, I would probably opt for a full frame. But, at least for now, I love travelling and creating microstock is a good excuse to do it, so I do not change my camera. I realize that in this podcast I mostly talk about money, which I'm sure is a great topic for all of you. I'm a $3000 a month producer, who stopped to hope to become an artist after realizing that producing art is something very complicated. I'm joking using the word masterpiece, but I had a lot of fun watching it. May I ask you why you did not submit your stock footage to iStock & Getty images? Istockphoto was my first agency, back in 2006. I was an exclusive contributor, but in 2008 I understood that my profits could rise giving up exclusivity. Then in 2013, I stopped uploading there because of a lack of sales: earnings didn't pay the time I spent while keywording. Anyway, there's a funny thing I noticed in the last three months. 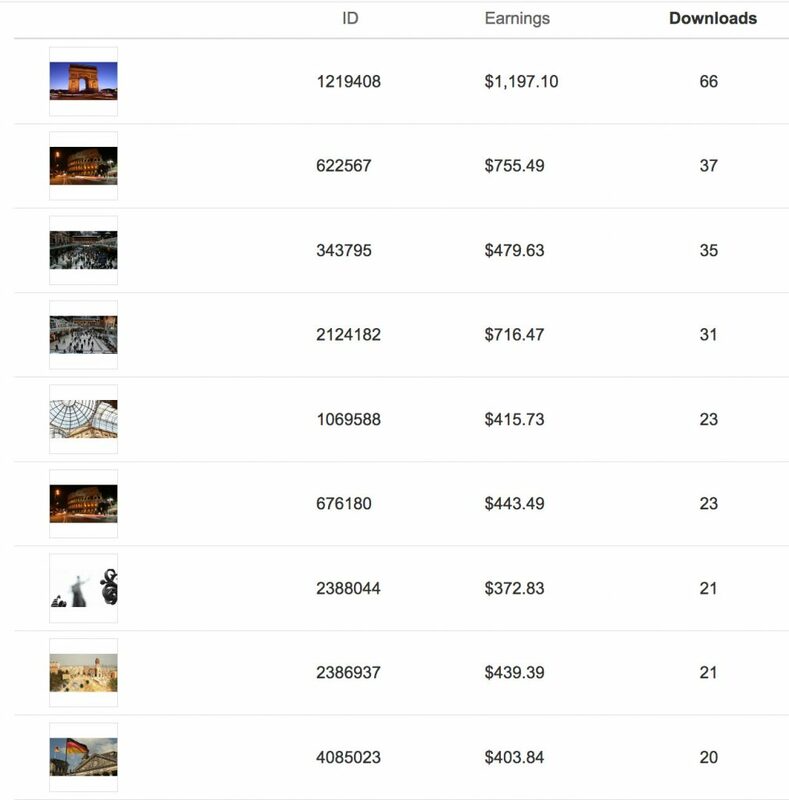 Regardless I haven't uploaded on Istock/Getty in the last five years; I've had more sales than what I earned in all the other months in 2017. Nothing so good, because it was only $300 for the period October/December 2017, even without any Christmas related content, but it's strange. Algorithms rule in this digital world. Ok, guys, the end is near, and so I face my final curtain, quoting a famous Italian American singer with blue eyes. I've also got sad news now. Artbeats, which is the last agency that paid to me more than $200 for a single stock footage sale is closing. and others. We don't have to be sad for that; the world changes every day. Sometimes changes are good for us, like when Apple created the Iphone, or when Uber came to town, and sometimes they are bad. Please, listeners, give me a five stars review on iTunes. Now it's time to say goodbye and see you in the next episode of selling your photos and videos online.